Artist Suzanne Morrissette uses a sensing program to create a poetic interaction. Photograph courtesy of Toni Hafkenscheid. Medium: Interactive installation with video and audio using MAX MSP software and Kinect hardware. (Kyle Duffield served as lead developer and technical consultant). Location: Stride Gallery, 1006 Macleod Tr. S.E., on display until Nov. 9 as part of touring exhibition wnoondwaamin | we hear them (Autumn Chacon, Jeneen Frei Njootli, Melissa General and Suzanne Morrissette, artists; Cheryl L’Hirondelle, project mentor; Lisa Myers, curator). Note: Morrissette’s one and the same was produced with the support of the City of Toronto through the Toronto Arts Council. The exhibition at Stride Gallery is part of Contemporary Calgary’s nomadic programming while it prepares to move into the Centennial Planetarium. Contemporary Calgary and Stride Gallery are co-presenting the exhibition in Calgary. Throughout the exhibition, there will be an assortment of public programs developed in conjunction with M:ST Mountain Standard Time Performative Art Festival. We’ve become accustomed to sensors in public places. In the service of hygiene, safety and security, our movements trigger washroom sinks, grocery and bank doors and the alarm systems of airports and museums. Artist Suzanne Morrissette uses a sensing program for a more poetic interaction in her work one and the same, currently at Stride Gallery in Calgary. 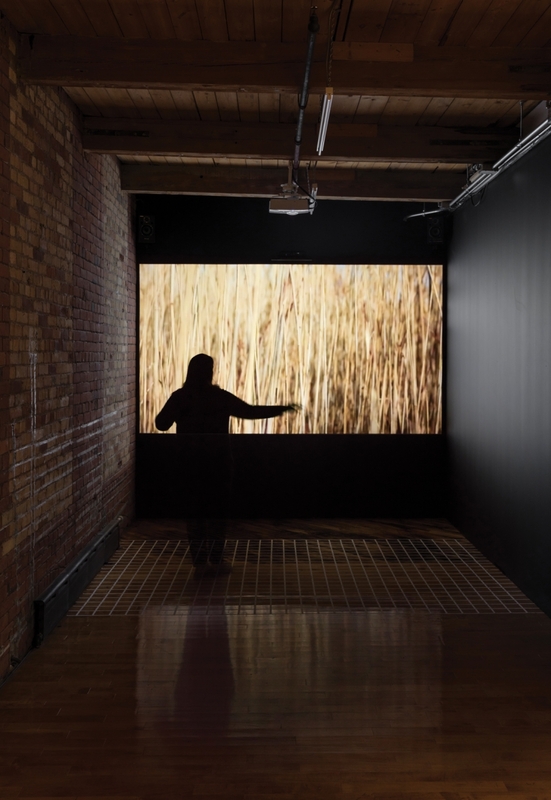 In the darkened gallery, an image from the water’s edge is frozen on a screen. Upon entering the space, video and audio begin to move in sync with the speed of your gestures. You engage in the landscape at the water’s edge from two perspectives: wind soughs through close-by reeds according to your rhythm; light plays on the wide view of open water and ice, sparkling in time to your movement. Body and landscape are linked in a mesmerizing mirror. The reflection does double duty, encouraging us to examine our relationship and our experience with nature through images and technology. Morrissette works with various media, including drawing, photography and video, often in ways that embrace experience on many levels. She is also a curator and academic (she recently earned a Ph.D. from York University in social and political thought) and taught at the Alberta College of Art + Design last year before moving back east to teach at OCAD University. Morrissette’s one and the same is part of wnoondwaamin | we hear them, a touring exhibition of works by four Indigenous artists, which began in North Bay and moved through Brandon and Saskatoon before landing at the artist-run Stride Gallery. This article appears in the October 2018 issue of Avenue Calgary. Subscribe here.